Consumer protection groups are warning that Southern California utility customers could end up footing the bill for pipeline upgrades needed to export natural gas at an ocean terminal in Mexico owned by San Diego-based Sempra Energy. The Utility Reform Network, a San Francisco-based nonprofit, and the California Office of Ratepayer Advocates want state utility regulators to address the concern before authorizing two major new pipeline projects. Sempra’s Mexican subsidiary IEnova last month signed a memorandum of understanding toward developing an export terminal with Mexican state oil company Petróleos Mexicanos at the existing Energia Costa Azul terminal, 35 miles south of San Diego. 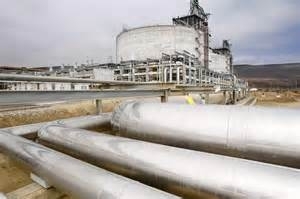 The terminal, which connects to the U.S. pipelines at Otay Mesa, opened in 2008 just before a surge in natural gas production flooded the U.S. market. San Diego Gas & Electric and Southern California Gas are seeking permission from regulators to spend $1 billion or more on new, large-diameter gas pipelines and compressors to shore up and expand gas delivery capabilities to San Diego utility customers. Costs would be passed on to customers of the utilities. Hawiger and the Office of Ratepayer Advocates also are questioning the need for a new 32-inch wide natural gas line between Fallbrook and the Mira Mesa area of San Diego as a remedy for safety concerns for an existing 16-inch line built in 1949. If the additional pipeline capacity helps transfer natural gas across San Diego for foreign export, costs should be borne by companies transporting the fuel, and not local utility customers, the Office of Ratepayer Advocates said in filings with the California Public Utilities Commission. The new 32-inch line from Fallbrook into San Diego would cost about $584 million to build, according to preliminary estimates by SDG&E and SoCal Gas. Estela de Llanos, director of major project development for San Diego Gas & Electric, said the new line across northern San Diego County is being proposed to address state safety requirements approved in response to the deadly 2010 pipeline explosion at San Bruno. It would also help back up a pipeline that now accounts for 90 percent of San Diego’s natural gas supply. De Llanos declined to comment specifically on whether export capacities would be enhanced, saying the pipeline was not designed with exports in mind. A decade ago, the state utilities commission weighed similar concerns about pipeline construction expenses as it authorized gas imports from Costa Azul. In that instance, $200 million in pipeline upgrades were deferred until the company could prove that they benefited local customers. Sempra was allowed to transport gas across the San Diego region to Los Angeles at a discount — a provision that divided commission members.